My husband and I love pizza, so I we decided to check out the new V Pizza at Jax Beach. They have a great location right near the beach with ample parking, and are connected to a bar if you feel like letting loose! The inside of the restaurant is so beautiful and rustic. It has a great feel. The fire all of their pizzas in these large brick ovens. We ended up trying 2 different types of pizzas. 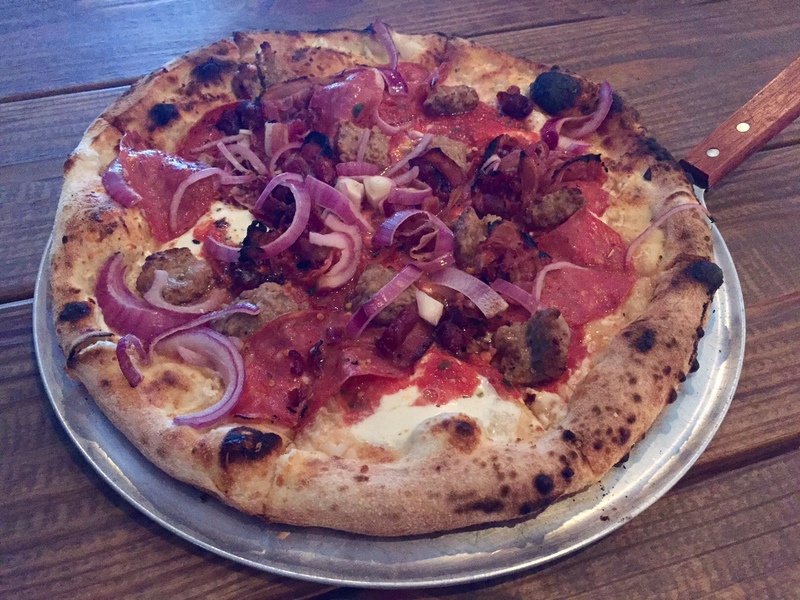 The first was the Pizza Carnivora with Sausage, Soppressata, Pancetta, Red Onion, Roasted Garlic, and San Marzano Tomato. I really loved this pizza! All of the meats blended together nicely and the pizza was loaded with toppings. There was not a bare spot on that pizza and it was fantastic! Pizza Capricciosa with Prosciutto Di Parma, Egg, San Marzano Tomato, Fresh Mozzarella, Mushroom, Black Olives, Artichoke Hearts, and Extra Virgin Olive Oil. I have never had a pizza like this before. All of the toppings were so random but I loved it! Every bite was a little adventure since you never knew what kind of flavor you were getting. Then came dessert. They serve gelato at this location, so I had to indulge! They let you combine flavors so I ended up getting chocolate hazelnut and pistachio. As you can imagine, it was marvelous! This was some pretty great pizza! It is more of a knife and fork variety since the crust isn't all that firm, but the flavors will more than make up for the extra effort. Plus, the pizzas come out pretty quick so you won't be waiting long, which is a huge bonus for me!